Admission rates are for guests ages 6 and older. All riders must purchase a Gate Admission ticket. With the exception of Tuesday, there are no single-day passes available through MX Sports. Guests wanting to attend Saturday's Pro Supercross only must purchase tickets directly from Daytona International Speedway (DIS) at the Fan Zone Box Office. *Friday and Saturday Advance Admission purchased by March 4 includes a discounted Saturday Pro Supercross ticket with special seating in the RCSX Bleachers. After March 4 Friday and Saturday Advance Admission will NOT include a Saturday Pro Supercross ticket. Guests wishing to attend the Saturday Pro Supercross after March 4 must purchase a ticket directly from Daytona International Speedway (DIS). View Saturday only ticketing options HERE. Tickets purchased directly from DIS will not include access to the RCSX Bleachers and are non-refundable. 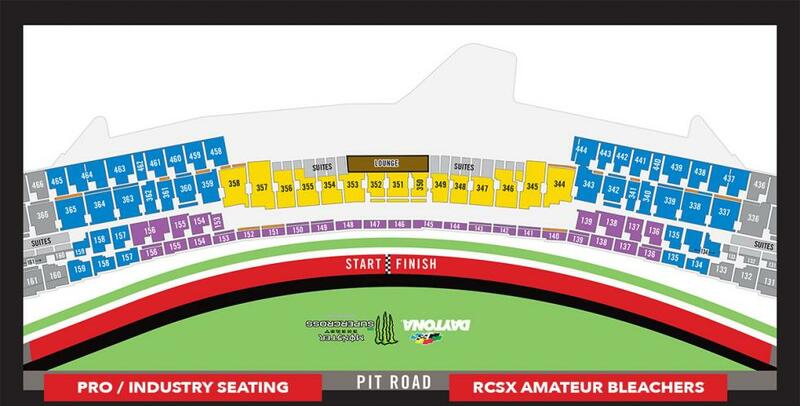 RCSX racers and their families will be parked in a designated camping area. In order to park in this area, camping passes must be purchased from MX Sports. Guests purchasing camping permits directly from Daytona International Speedway (DIS) will not be permitted to park in this area and will not be given a refund if requested. We encourage all racers and their families to purchase all passes from MX Sports. Non-Hookup Campsites located near NASCAR Garage Area. NASCAR Garages: These are the actual garages used by NASCAR!! Extra Car Pass: If you have a non-camping vehicle, you must purchase an Extra Car Pass for an additional fee. All non-camping vehicles remaining on-sight overnight must have an Extra Car Pass. Race Day Parking/Pitting: A Day Lot for non-camping Racers and Guests will be located behind the NASCAR Garage. There is no fee to park in this lot. No overnight parking in the Day Lot. The Day Lot must be cleared 2 hours after racing daily. Pit Vehicle Permits: A Pit Vehicle is a golf cart, scooter, electric motorcycle, UTV or small pit bike only (No ATV’s or hoverboards). Pit Vehicles may be operated by Permit only. Unauthorized Pit Vehicles will be subject to impound. Only adults may operate a Pit Vehicle (18 years +). For your convenience, the Race Order has been pre-determined. Please consult with the Race Order prior to registering for classes to avoid conflicts, as the Race Order will not change. AMA Membership: An AMA membership valid through the date of the event is required in order to register. Medical Insurance: Medical insurance current through the date of the event is required in order to compete. Eligibility Approval for Non-U.S. Racers: All non-U.S. citizens or riders participating in foreign motocross competitions outside the U.S., must obtain eligibility approval from the AMA prior to participating. For an application contact the AMA Amateur Motocross Racing Department or click HERE. Check-In: All riders must check-in at Rider Registration at the Costa Boardwalk Club Building. This includes pre-registered riders! This event will be scored with the MYLAPS MX Transponder. Each racer is required to have a transponder. Transponders may be purchased prior to the event at mxtransponder.com. Transponders may be rented at the event during the registration check-in process. The rental fee is $25, plus a $100 deposit that will be refunded upon return of the transponder. The $25 rental fee must be paid by cash only. If you need an ATM, we can direct you to one onsite.